This year I've been experimenting with slow roasting chile peppers to a crisp in the oven. This experiment actually started by accident last year when I attempted to slow cook some peppers in a 200F oven hoping to get some tender melting soft peppers that I could puree into a paste. My efforts rewarded me with crisp toasted peppers instead, at least I managed not to burn them. I didn't want to throw them out so I experimented with grinding them up to sprinkle on various things and found them to be absolutely delicious. That first batch was cooked with some olive oil and salt which I figured wasn't the best for long term storage and was rather messy to grind so I did one more batch without the oil and salt and, wow, they were even better than the first batch. 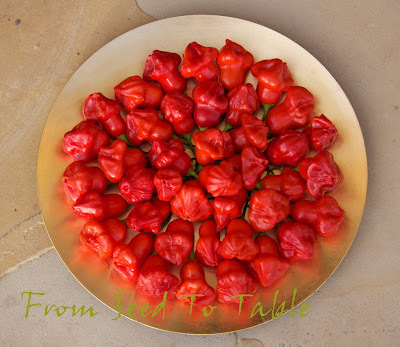 Those were Aji Angelo peppers, a mild baccatum pepper with just a hint of heat and an aromatic fruity flavor. I've found that in general I prefer to use the ground Aji Angelos in place of store bought pepper flakes since the Ajis have a lot more flavor and are less spicy. Here's a photo of the last of my ground Aji Angelos from last year. Shown below are Christmas Bell peppers, another mild baccatum pepper, cut in half, seeded and ready to go in the oven. It took about three to three and a half hours for the peppers to become crisp. The thinner fleshed Aji Angelos take about two to two and a half hours to become crisp. You have to keep your eye on the peppers as they get close to crisping up, they go quickly from a nice red color to brown. I pull the pan out of the oven when the peppers become leathery and let them cool in the pan, they crisp up as they cool and any peppers that still have soft spots go back in the oven for 10 minutes or so and cooled on the pan again. I grind the peppers using the food grinder attachment to my mixer. The Christmas Bells came out as a coarse powder as you can see below. The Aji Angelos were ground using the same method as the Christmas Bells but came out as flakes rather than powder. I think that that is because the Aji Angelos are thinner fleshed and have tougher skins than the Christmas Bells. Today I'm roasting a batch of Kaleidoscope peppers, another baccatum pepper that is similar to the Aji Angelos in texture but is not at all spicy. It'll be interesting to see how the Kaleidoscopes grind up. I keep most of my roasted peppers whole in glass jars. I've only ground the Christmas Bells so far this year and am going through the last of the 2009 Aji Angelos. Once I've ground the peppers I like to keep them in the refrigerator to preserve the color and aroma which dissipates more quickly once the peppers have been ground. I dry most of my peppers in a dehydrator but I've found that I really like the way the Aji peppers taste when they are slow roasted in the oven. The roasting caramelizes the sugars in the peppers a bit and seems to intensify the aromas and flavors. 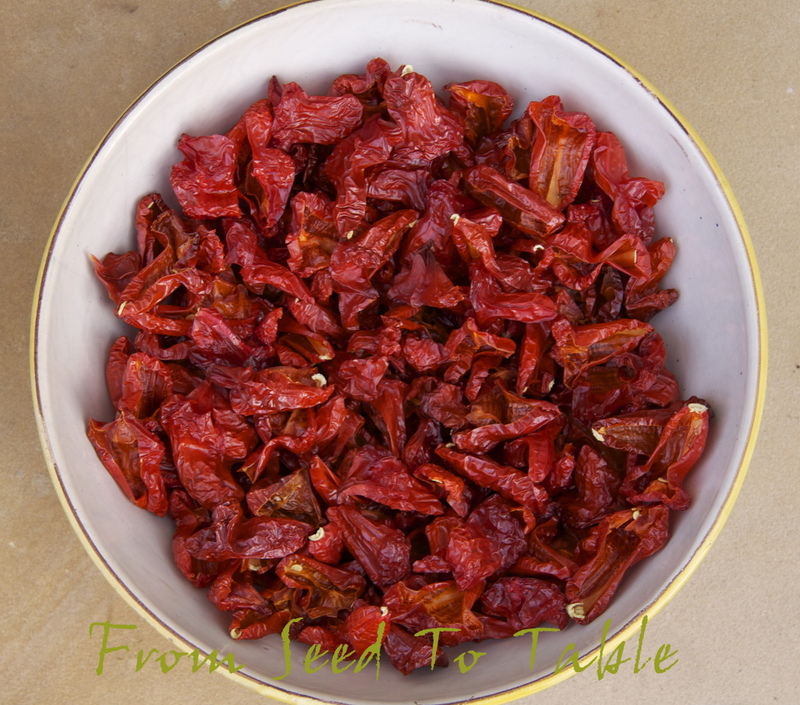 You wouldn't believe how delicious the peppers smell as they roast and when you open a jar of dried peppers, either whole or ground, the aroma is still fabulous. One of my favorite uses for the ground peppers is to sprinkle them on cooked vegetables, eggs, open faced toasted cheese sandwiches, pasta dishes, etc. Lately I've been incorporating them into crispy parmesan breadsticks. 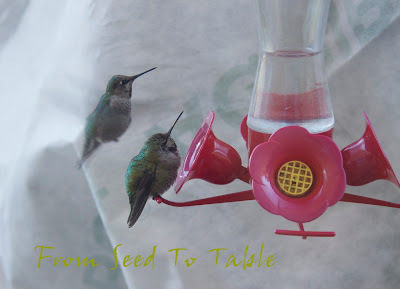 They are fantastic used in marinades for just about anything. One of my favorite quickie marinades is olive oil, fish sauce, garlic, and pepper flakes, fresh cilantro or dried oregano is also a great addition. So, how do you think you would use ground slow roasted peppers? Are you tired of seeing peppers on my Harvest Monday posts? Well, you won't being seeing much more after this week, here's almost the last of the bunch. Freezing night time temperatures swooped down upon us out of the Gulf of Alaska last week so I stripped most of my pepper plants of all their peppers. I say this is almost the last because I brought one potted plant that was loaded with ripening pods indoors and you'll get to see those peppers in the next week or so. I tried some of the green Aji Santa Cruz peppers pan fried like padron peppers but the skins were too tough and they just didn't have the same great flavor so I won't be trying them that way again. Next, I'll be trying some of them stewed in their own juices with some garlic and herbs to see if that works better. Most of the green Christmas Bells turned red after sitting at room temperature for a few days so today I dried them in a 200F oven to grind into flakes. Aji Santa Cruz peppers - 3 lb., 11.75 oz. Kaleidoscope peppers - 1 lb., 14.25 oz. Christmas Bell peppers - 2 lb., 6.25 oz. Guyana peppers - 2.5 oz. PI 593480 (Morocco) peppers - 8 oz. 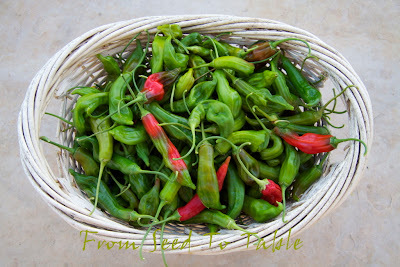 Madrid Bell Sweet peppers - 13.5 oz. Tobago Sweet Scotch Bonnet peppers - 3.25 oz. Suave orange peppers - .5 oz. Aji Pineapple peppers - .5 oz. Topepo Rosso peppers - 1 lb., 15.25 oz. Cuerno de Cabra peppers - 9.5 oz. 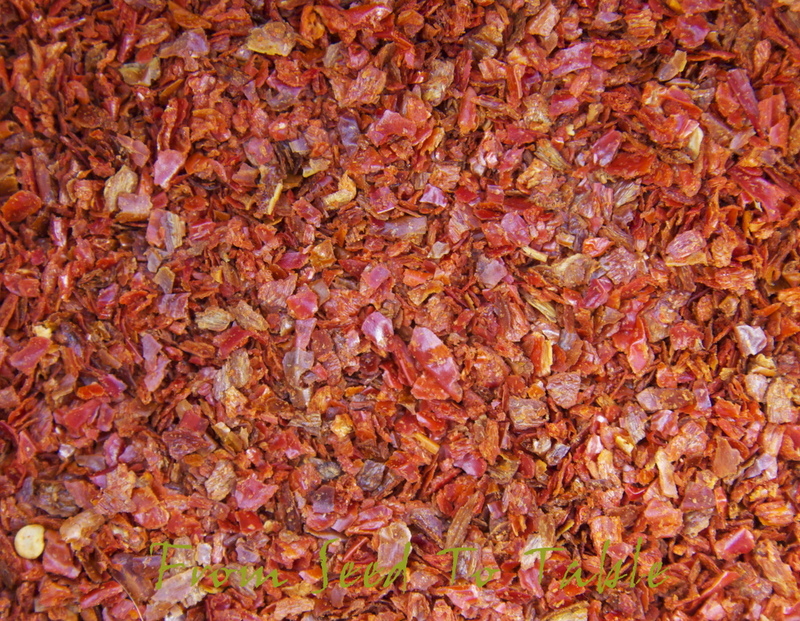 Christmas Bell Picante peppers - 9.25 oz. Andine Cornue tomatoes - 1 lb., 15 oz. The total for the week was - 14 lb., 13.5 oz. The totals for the year are - 693 lb., 8 oz. 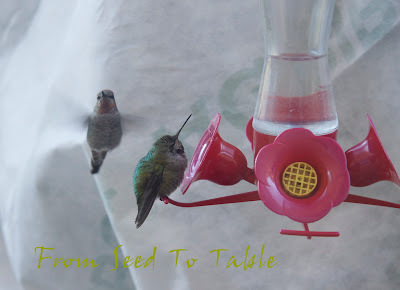 If you would like to see more harvests that other garden bloggers are gathering then head on over to Daphne's Dandelions, the home of Harvest Monday. This soup was inspired by a recipe that used pearl barley, leeks, beef broth, light cream and milk, and spinach, none of which I had on hand. I made substitutions using what I did have and modified to accommodate the longer cooking kale instead of the quick wilting spinach and ended up with an incredibly delicious soup. A funny thing happened though, my husband and I were happily slurping the soup up and we both came up with notion that the soup cried out for clams... next time. One note about about farro, which is an ancient type of wheat* - be sure to use one that has been milled a bit to remove some of the bran (pearled) because unmilled wheat berries take forever to cook and seemingly never become tender. Of course, if you have pearl barley in your pantry, use that. Combine the farro, 1/2 teaspoon salt and water in a saucepan and bring to a boil. Reduce the heat to low, cover and cook until the farro tender but still has a little bite, about 45 minutes to an hour. Add the kale to the pan and continue to cook 10 or 15 minutes longer, until the kale is tender. While the farro is cooking, melt the butter in a soup pot over medium heat. Add the onion and celery root and saute until the onion becomes translucent, 4 to 5 minutes. Add the stock and bring to a boil over high heat. Reduce the heat to low and simmer until the celery root is tender, 10 to 15 minutes. Remove from the heat and let cool slightly. Roughly puree half of the soup and return it to the saucepan. Add the cooked farro and kale along with the cooking water to the soup. Stir in the creme fraiche and simmer the soup until hot. Season with salt and pepper to taste. Last night brought the first freeze of the season (note the frost cloth draped over the Meyer Lemon tree in the background). 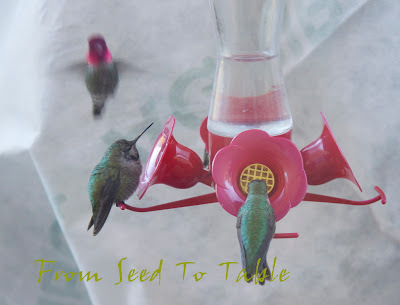 I always worry about the resident Anna's Hummingbirds on nights like this, they don't migrate so they have to endure these long freezing nights by going into torpor, a state in which their metabolism is drastically reduced. It's almost like a state of suspended animation and it makes them vulnerable since they are slow to come out of it. 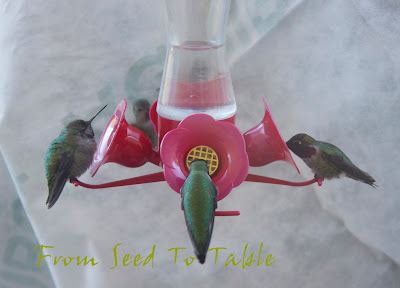 They need to fill up with nectar before they find a place to roost at night and then they need to feed as soon as they awaken. 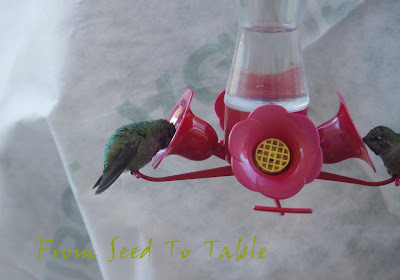 I've been filling the feeder that hangs outside my kitchen window almost every evening, it's rare that it isn't empty by then. Note the level of nectar in the feeder shown in the photos below, the feeder was filled the evening before and was 90 percent full first thing in the morning and was reduced to the level shown in little over an hour. the feeder was already abuzz with a dozen or so hummers a good hour earlier at first light. For some reason another hummer found the port she was occupying to be tastier than the other (vacant) ports. Some of the rest of the gang came along while she was still trying to wake up. And then an aggressive male came along and decided to clear everyone else out. The feeder was completely empty well before noon, so I treated the hummers to an early refill since I'm spending lots of time in the kitchen today getting a head start on Thanksgiving dinner and I can't resist the show. I read just the other day that we had one of the warmest Octobers on record. And we had more summer-like weather last week, with high temperatures of 90F on a couple of days. That probably accounts for the goodies that I harvested last week. The pepper plants are still putting on a show also. Clockwise from the top left are Iberian Long Cayenne (more scrunchy than long now), little yellow Aji Pineapples, Aji Santa Cruz, one yellow Guyana, wrinkled Rocotillos, one more Chorizero, Kaleidoscopes, and yet one more yellow Guyana. The most productive of all my Capsicum chinense plants this year is this Rocotillo plant. I had to take a photo before I harvested the ripest peppers shown on the tray above. I'm tempted to unhook that pot from the drip system and bring it indoors during the freezing weather so that the rest of the peppers can ripen on the plant. This has also turned out to be my favorite of all the chinense peppers that I grew this year. I also harvested a bunch more Christmas Bell peppers, the sweet ones were pickled and the picante ones were cored and dried in a 200F degree oven. There's a bunch more on the plants that are coloring up that I'll have to pick a tad under-ripe but they'll still be sweet and tasty. Other than that, I pulled one more BIG celery root that was still mild and delicious. I made a soup with half of it and a bunch of kale (which I neglected to weigh). That soup is delicious and I'll be posting the recipe any day now... And the Golden Chard has recovered from the attack of the aphids and ants so I harvested a bunch of that to use in Zuni Cafe's Onion and Chard Panade - yum. Golden Chard - 1 lb. Malaysian Dark Red eggplant - 2 lb., 9.5 oz. Aji Pineapple peppers - 1.25 oz. Aji Santa Cruz peppers - 2.75 oz. Chorizero pepper - .75 oz. Christmas Bell peppers - 1 lb., 12 oz. 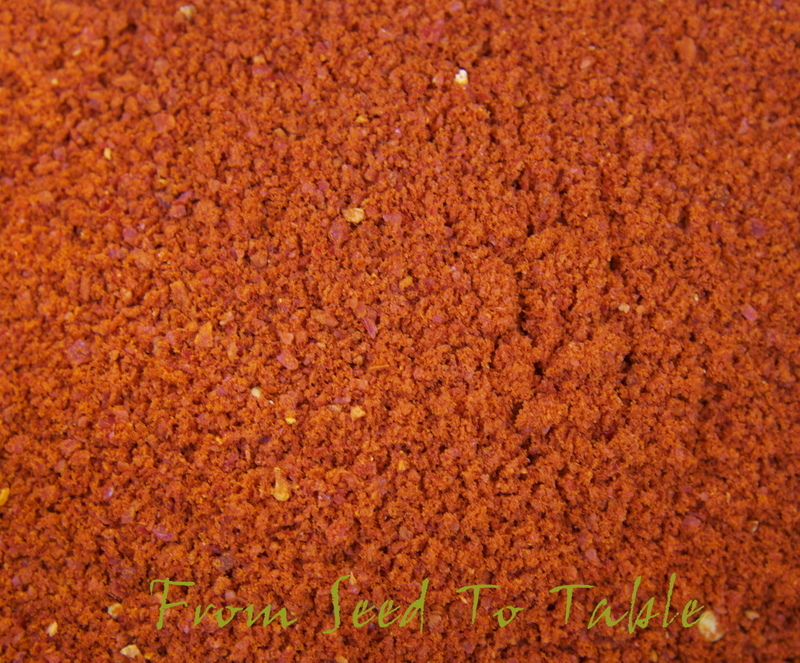 Guyana peppers - .5 oz. 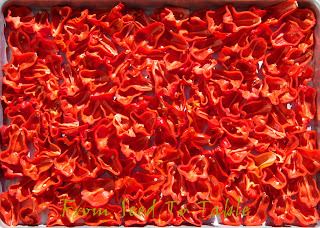 Iberian Long Cayenne peppers - 2.5 oz. Kaleidoscope peppers - 4.5 oz. Madrid Bell Sweet peppers - 1 lb., 3.25 oz. 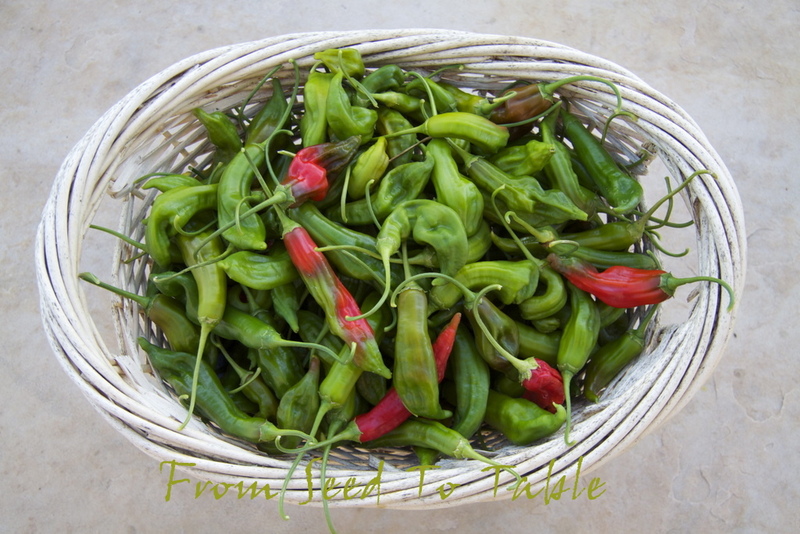 Rocotillo peppers - 5.5 oz. Topepo Rosso peppers - 2 lb., 15 oz. The total for the week was - 15 lb., 6.75 oz. The total for the year is - 668 lb., 8.25 oz. 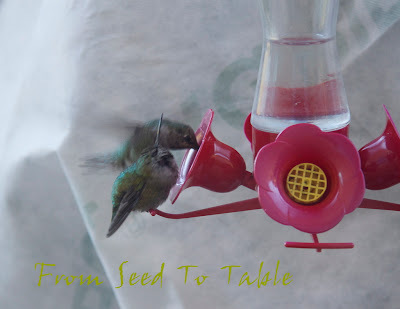 Harvest Monday is hosted by Daphne on her blog Daphne's Dandelions, head on over there to see what other garden bloggers have been gathering from their gardens. It was slim pickings in the garden last week, but I did add a couple new varieties to the harvest basket. 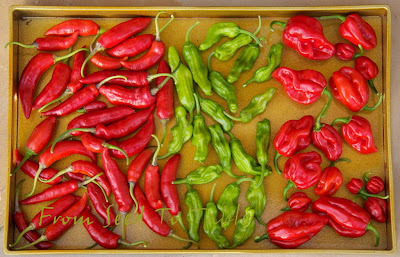 The photo shows the first harvest of Aji Angelo peppers (top) and the first Puerto Rico No Burn peppers (the small red ones in the center), plus more Espelette and Suave Orange peppers. 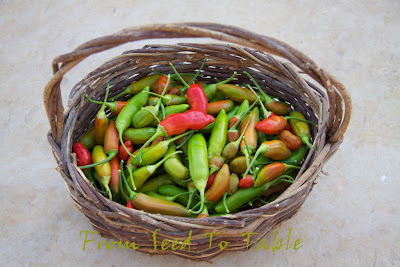 The Aji Angelo peppers were harvested from a plant that was in the garden last year. This variety is a mild baccatum pepper. The plant has been very resilient, surviving a couple of frosts in the open garden last winter and then a rather brutal transfer to a pot in the spring and irregular watering and feeding over the summer. Last year I preserved them by cutting them in half and removing the cores and then I slow roasted them in a 200F oven until they were crisp. The roasted (toasted?) 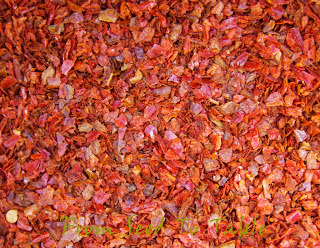 peppers are excellent ground or flaked. Last week I made a batch of my eggplant bruschetta topping and crumbled a couple of the remaining dry peppers from last year into it. They added a nice sweet pepper flavor and pretty little flecks of red, but no heat. I haven't gotten around to preserving the latest harvest of these peppers, but will probably slow toast them as well. The Puerto Rico No Burn peppers are a sweet cousin of habanero peppers. Unfortunately, the plants didn't like the cool summer weather that we had this year and set only tiny little pods, although a number of them have a surprising number of seeds. I suspect that even in optimal weather that the peppers will be small. These peppers are going into a batch of pickled peppers. I preserved the Suave Orange peppers using the 200F slow toast method and you wouldn't believe how incredible they smelled as they were roasting. Other than the peppers, the only other vegetable that I harvested was a bunch of Lacinato kale. Lacinato kale - 14 oz. Aji Angelo peppers - 9.25 oz. Espelette peppers - 12.25 oz. Puerto Rico No Burn peppers - 2.75 oz. Suave Orange peppers - 1.75 oz. The total for the week was - 2 lb., 8 oz. The total for the year is - 653 lb., 1.5 oz. 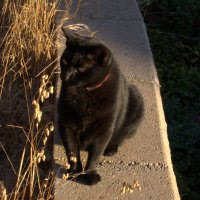 Harvest Monday is hosted by Daphne on her blog Daphne's Dandelions, head on over there to see what other garden bloggers have been growing lately. 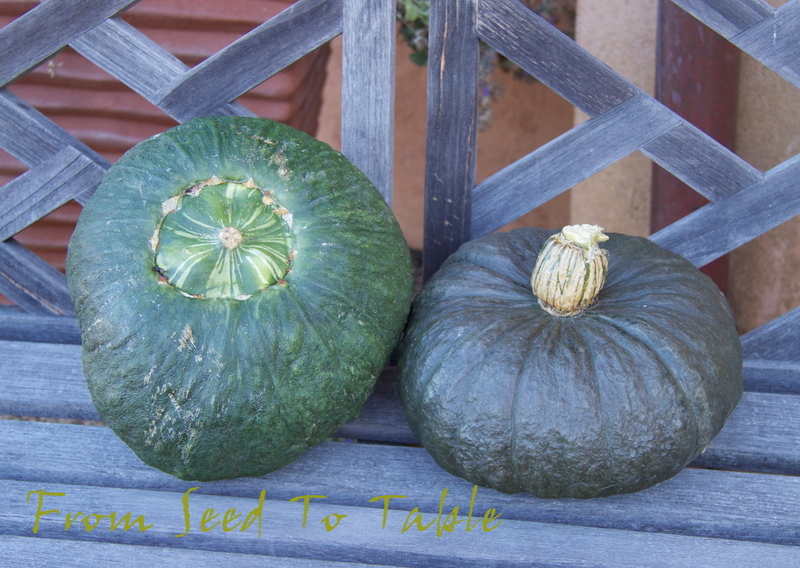 The fourth and last Marina di Chioggia squash came out of the garden last week. 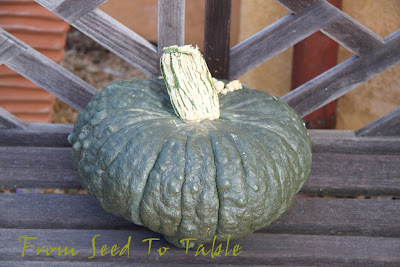 This specimen is the most true to type of all the Chioggia squash that I grew this year. 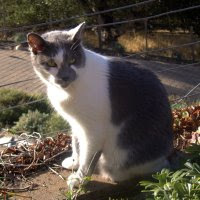 It has the characteristic blue-gray color, the ridging and some knobbiness, although it could be more knobby. And it has the turban on the bottom. 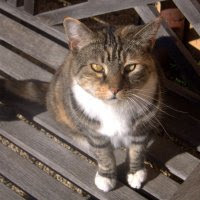 It's also weighing in at a fairly typical weight of over 13 pounds. Other than the squash the only other vegetable that I harvested was some kale. I've been working my way through previously harvested squash, celery root, peppers, tomatoes, and a few other items that I picked up at the farmer's market. 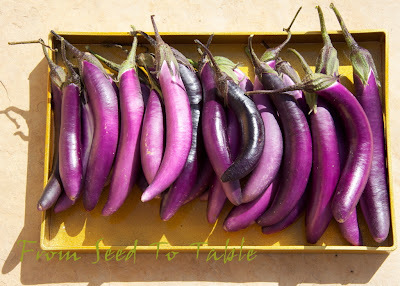 There will be a trickle of a few more peppers and eggplants as they finish ripening, but other than that, the harvests in coming months will be mostly for immediate consumption. Thank goodness, the freezer is stuffed. 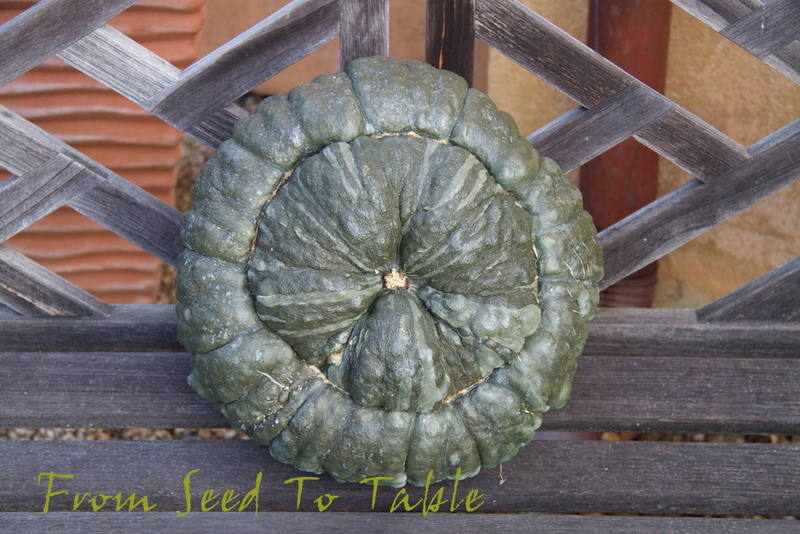 Marina di Chioggia squash - 13lb., 3.25 oz. Portuguese Dairyman's kale - 1 lb., 4 oz. The total for the week was - 14 lb., 7.25 oz. The total for the year is - 650 lb., 9.5 oz. There are lots more Harvest Monday posts to be found at Daphne's Dandelions, head on over there and check them out. 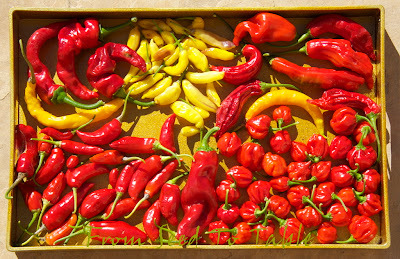 The harvests last week stayed colorful with the addition of some new peppers to the harvest basket. 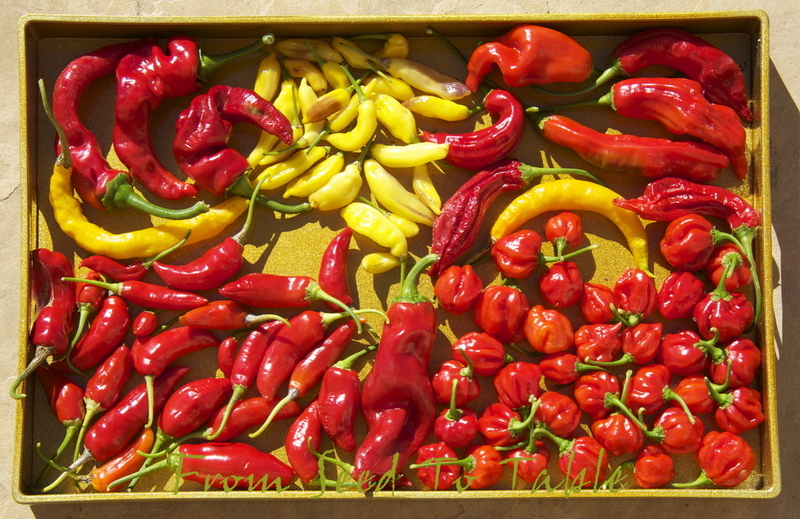 The tray below holds, from left to right, Kaleidoscope, Shishito, and Tobago Sweet Scotch Bonnet. The Kaleidoscopes are a baccatum species pepper. Don't they look hot? Well, they are completely not, nope, none, not trace of heat at all in those babies, totally sweet. All of those went into a batch of refrigerator pickles. Shishitos are popular as a frying pepper, picked immature they are generally sweet, but they do surprise you once in a while with a hit of spice! These turned out to be a bonus pepper. I got the plant in September at the farmer's market, I purchased some herb plants from a vendor there and we got to talking about pepper and tomato varieties and he gave me the Shishito plant to try. It was rather late in the season for planting a new plant but I went ahead and stuck it in a big pot in the garden. 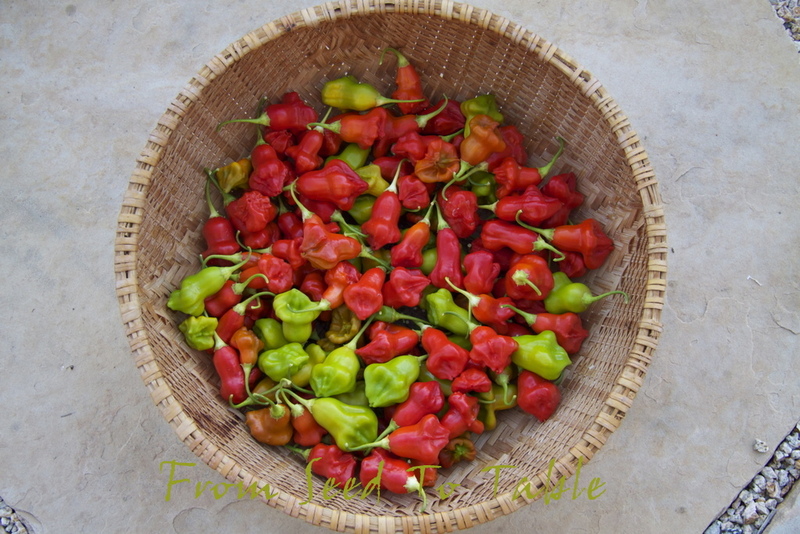 Last week I took a look at the plant and to my surprise found a nice handful of peppers ready to harvest. There is definitely an advantage to growing peppers that are harvested green and immature, it really speeds up the date of the first harvest. The next pepper, Tobago Sweet Scotch Bonnet, which is a chinense species, takes a long time to produce ripe peppers in my climate. 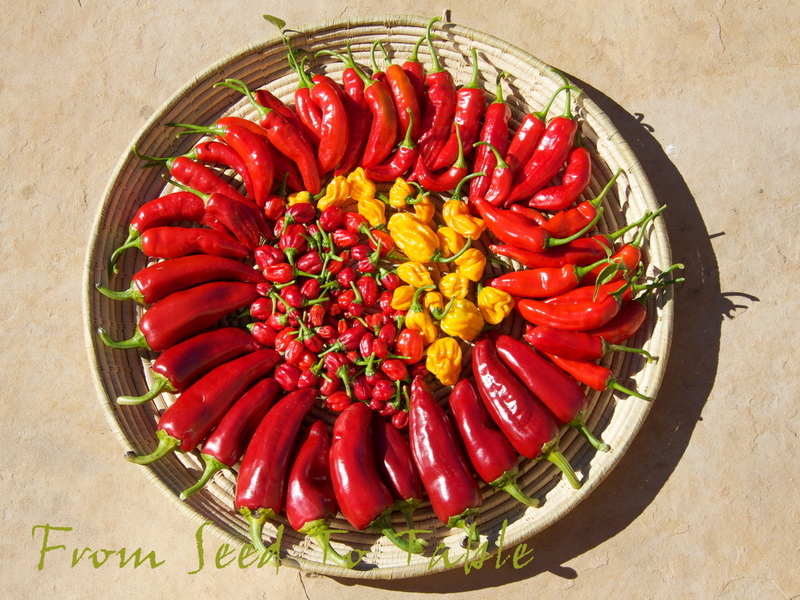 All the chinense peppers take a long time to produce ripe peppers here, but I love to experiment with growing them because they produce some of the most flavorful peppers around. They also produce some of the hottest peppers around, such as Habaneros. 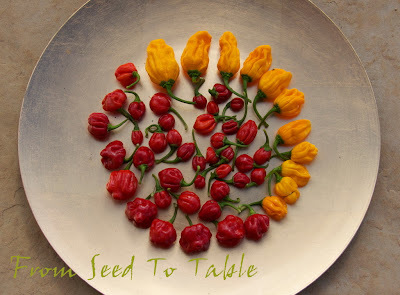 I'm not a fan of exceptionally hot peppers so I restrict my chinense experiments to the mild members of the family. Tobago Sweet Scotch Bonnets are about as hot as I can go, with about the same heat as a Serrano pepper, but much more fruity and aromatic. The next tray holds my harvest of another two mild chinense peppers. The yellow ones are Suave Orange, a variety developed by the Chile Pepper Institute at NMSU. You can get seeds from the institute but I got my seeds from Renee's Garden. NMSU says that these have about 800 Scoville Units of heat, for comparison NMSU says that Orange Habaneros have 210,000 Scoville Units of heat. My peppers are very mild with just a trace of heat in the core and ribs. The red pepper is Rocotillo, again almost totally sweet, but with all the characteristic aroma and flavor of the dreaded Habanero. 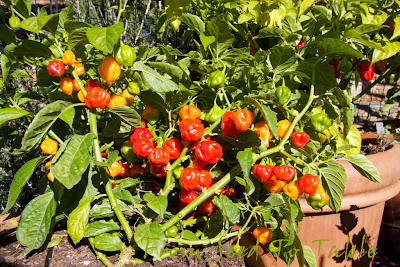 This is one of my favorite sweet chinense peppers so far since it is one of the most aromatic and flavorful varieties. 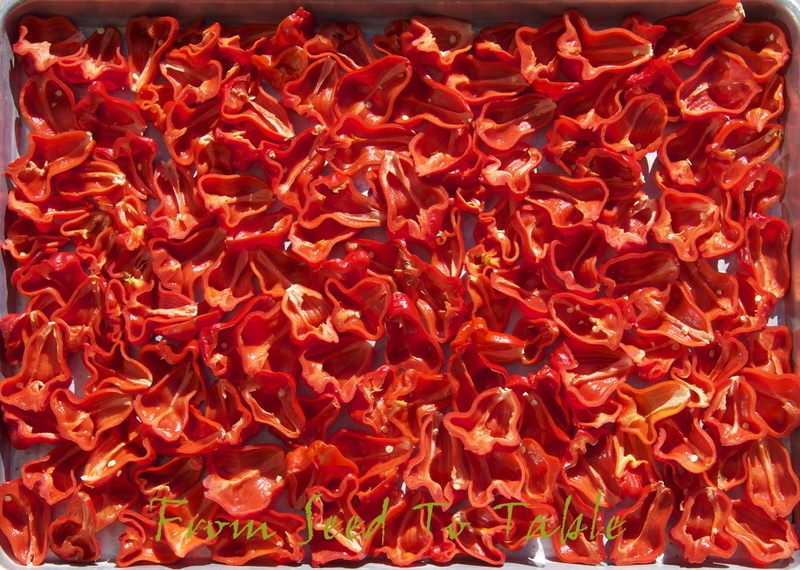 Next is a tray full of Christmas Bells, another baccatum pepper. I grew these last year and loved them. They have a lovely fruity flavor and are almost totally sweet with just barely a trace of heat in the core. 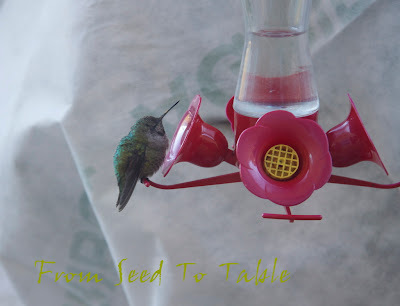 So I saved some seeds from the one plant that I had purchased from Cross Country Nurseries and crossed my fingers and hoped that this year the plants would come true. So here's the first ripe peppers from two of the three plants that are growing in the garden. They are just what I hoped for, a crisp, sweet, fruity flavored, medium thick fleshed pepper with just a trace of heat. Perfect for pickles. There are now three quarts of mixed Christmas Bell and Kaleidoscope pickled peppers residing in the extra fridge. The peppers on the third plant are ripening more slowly and it turns out that they picked up a new characteristic. 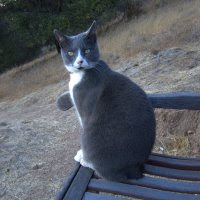 I found that out the hard way, I plucked one of the first runty little ripe peppers, ripe to the point of wrinkling, and chomped on it whole, and to my surprise my mouth started to tingle, the back of my throat started to burn, and I started to tear up. Dang, it was far more spicy than I expected! I'll have to come up with a different use for the peppers from plant #3. 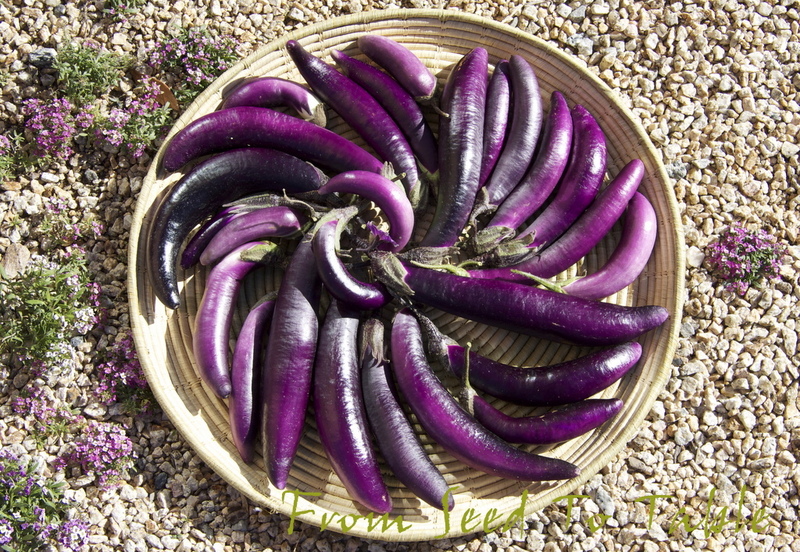 The Malaysian Dark Red eggplant is still producing! Here's almost 4 pounds of them and there's still some young ones sizing up on the plants. Wow, this variety turned out to be a far better producer than I had hoped for since there was no indication in anything that I had read about them that they would produce well in my cool climate, especially in a cooler than usual year. I think I'm going to roast these whole and freeze them so that I can make more of the bruschetta topping that I mentioned in an earlier post. 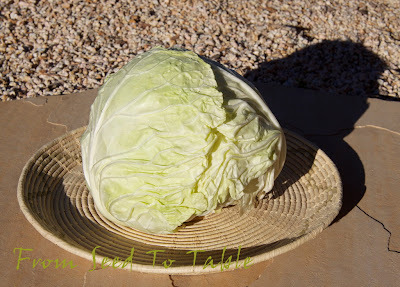 And now, something more autumn-like, the first Testa di Ferro savoy cabbage (thanks Winnie). 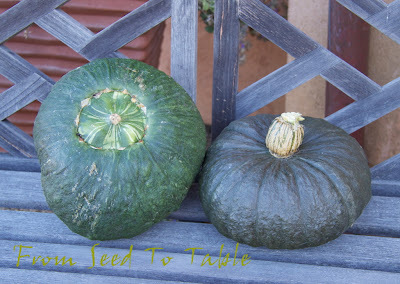 And 2 more Marina di Chioggia squash. Again, these aren't really true to type, they should be more ridged and knobby, and the the turban should be much larger. The first Marina di Chioggia squash that I harvested the week before was even less true looking, although the texture and flavor were not disappointing. I used some of the last of that squash last night to make raviolini and it was perfect for it. This variety makes a great stuffing for pasta since it has flesh that is dense and fairly dry so you don't have to drain off extra liquid from the puree to keep the pasta from getting soggy. Neither photographed nor weighed were a couple of harvests of the first Lacinato kale. It was harvested on one of those evenings when I dashed out to the garden, picked and immediately cleaned and cooked without ever giving a thought to how much I harvested. 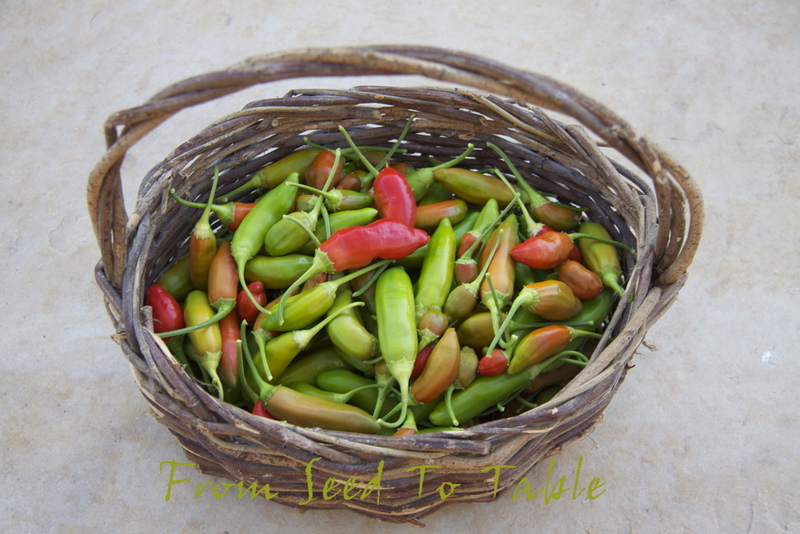 I also harvested the last of the Garafal Oro romano beans when I pulled the plants out. And by now you know what celery root looks like so I didn't photograph the third harvest of that. And a few more tomatoes are trickling in. I pulled out all the tomato plants other than the cherries and paste. I've got a bunch of green tomatoes from the yanked plants that aren't included in the harvest totals, perhaps I'll include them as I use the up (if I remember). Garafal Oro romano beans - 15.5 oz. Testa di Ferro savoy cabbage - 2 lb., 15 oz. Diamante celery root - 6 lb., 14.75 oz. Malaysian Dark Red eggplant - 3 lb., 12 oz. Chorizero peppers - 5 oz. Christmas Bell peppers - 1 lb., 8.75 oz. De La Vera peppers - 6.25 oz. Guyana peppers - 9.5 oz. Kaleidoscope peppers - 7.75 oz. Rocotillo peppers - 3.25 oz. Shishito peppers - 3 oz. Suave Orange peppers - 1.5 oz. Tobago Sweet Scotch Bonnet peppers - 6 oz. 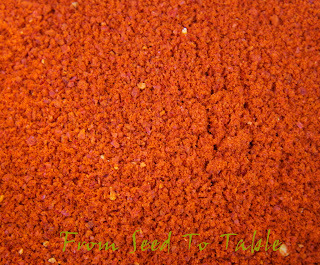 Andine Cornue tomatoes - 1 lb., 2.5 oz. Aunt Ruby's cherry tomatoes - 9 oz. Galinas cherry tomatoes - 9 oz. Marina di Chioggia squash - 15 lb., 11 oz. The total for the week was - 36 lb., 12.25 oz. The total for the year is - 638 lb., 3.25 oz. You can see a lot more harvests at Daphne's Dandelions, home base for Harvest Monday. Head on over there to check it out and join in the fun, show us what you've been harvesting lately.